Update: Microsoft has opened up a little about the transition to Nokia Lumia and revealed that a new Microsoft Lumia product will be coming soon. "We are looking forward to unveiling a Microsoft Lumia device soon," said Tuula Rytilä, Senior Vice President of Marketing for Phones at Microsoft. 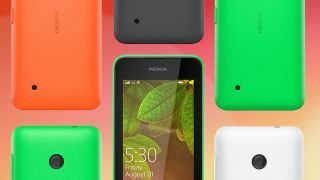 "This is of course a natural progression as all devices that once came from Nokia now come from Microsoft." Speaking on the official Nokia blog, Rytilä explained Lumia's new standing alongside Microsoft's other brands like Xbox, Surface and Windows. Changes have already begun to appear with the company's apps and social media channels renamed and product packaging in line to follow. The transformation may be complete but Microsoft wisely isn't doing away with current handsets. Rytilä confirmed that all existing Lumia handsets will continue to be supported by the big MS.
Microsoft is set to officially drop the Nokia brand in favour of Microsoft Lumia. The move has been expected for a while, with internal documents leaked last month explaining that the Redmond company would be ditching references to both Nokia and Windows Phone. Now Microsoft has confirmed to The Verge that the change is official. This means that in future there will be no Nokia Lumia handset, but instead Microsoft Lumia. Nokia France will be the first region to change to Microsoft Lumia, which will be reflected on its Facebook, Twitter and other social media accounts. Nokia won't completely disappear, with the Finnish company continuing to focus on mapping and network infrastructure. Just don't expect to see 'Nokia' printed on any new handsets. While Microsoft confirmed it's dumping the Nokia brand, it didn't shed any further light on the future of Windows Phone. In the same leaked documents that suggested Microsoft would be ditching the Nokia brand it was also hinted that the 'Windows Phone' brand would be dropped. But we'll just have to wait and find out.